At Mia Cake House, we love inviting children to create masterpieces in our atelier. Children’s eyes sparkle when presented with the bare canvas of an undecorated cake, or the ingredients to measure and churn into delicious cookies. Birthday parties at Mia Cake House are lively, joyous events where young artists can unleash their creativity through the tactile mediums of flour, sugar, and a rainbow of fondant, sprinkles, and glitter! We offer a variety of packages to fit the age and individual personality of your child. We can accommodate up to 24 guests (for children 8 and older) – numbers are limited so that we can give personal attention to each child (Base package – 12 participants). We are located in a central plaza, easily accessible from Dade and Broward with lots of parking space. For older children (ages 9-15), parents’ presence is optional and welcome. For young children (up to 8 years old) we require that each child have an adult present. We find that parents enjoy staying during parties for our younger guests. You can assist your child in the tasks we are performing, and share in the fun! * An automatic 15% gratuity will be collected the day of your event. Can we invite more children to the party? We can accommodate a maximum of 24 children (drop off party) or 20 children with their parents in our atelier (for children 8 and under). This way we can teach new skills and create a fun-filled birthday atmosphere, while giving each child the personal attention that we are famous for. From what age can the parents drop off? Where is the party held? Parties are held in our atelier, located on University Drive at Sunrise Blvd, in Plantation, FL. You can find the exact location on our contact page. We are centrally located, and have plenty of parking space. You do not have to bring anything. We will supply all the ingredients and tools for the party. We will also serve cupcakes as a snack. If you wish, you can bring food and drinks, plates, etc. What is the payment and cancellation policy? 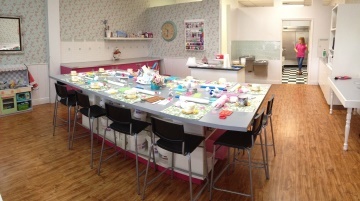 Mia Cake House atelier is used frequently for our cake decorating workshops, and there are many of them, so you should reserve your birthday party in advance. Upon reservation, we require a $150 nonrefundable deposit. The outstanding balance is due seven (7) working days before the event. You can also reschedule the party up to 30 days before. Cancellation or rescheduling less than 30 days prior to the event may result in deposit forfeiture and/or an additional charge to cover expenses incurred. What about Vegan, Gluten free baking? Mia Cake House is kosher style. We use only Parve and Dairy products with no animal grease. But we do not hold a Kosher certificate.